I am a back-pew person. I am most comfortable in the back pew of not only my Church, but any Church. When visiting different churches I always seem to migrate to the back pews for Mass. I am happiest there, and as a result, I feel more involved. I am what I am…a back-pew person. I can hear everything, see everything, and sing with abandon…or not even open the hymnal. No thoughts of whether or not my hair in the back is tangled or disorganized. No worries if my coat is hanging correctly, or if I have something stuck on the back of my pants. Collar sticking up? Shirt not ironed? Old pants that have probably seen better days? Totally irrelevant to why I am there. I can observe without being seen. I like that. When I mentioned this to my mother and asked her what she was, she just laughed and said she was a middle pew person. Being in the back doesn’t afford her the luxury of being surrounded by people of the same faith; having people who believe as she does both in front and behind gives her comfort. She enjoys the community-feel of being in the middle – and at her age she doesn’t care about what her backside looks like either. Plus, an advantage of being a middle pew person is the fact that if my father falls asleep during the sermon she can nudge him before the priest sees (or hears) him, not to mention she has the advantage of observing the young children’s antics during Mass. So for them, being middle-pew people is a win/win. Then I asked my mom what she considered the personalities of front pew people. These are the ones who are truly into observing all the details of every Mass. They are the Eucharistic Ministers, the active participants with duties to uphold. Front pew people are also the very infirm who cannot see or hear as well as they used to and being in the front pew gives them greater comfort. Front pew people are also those with very young children; the actions of the priest keep young people focused and less likely to fidget. And then you have those who sit in the front pew so the priest knows they are actually there. Of course there are times when I have been a front pew person. On my wedding day, on my children’s Baptism Day, First Communion Days, and on those days when we had to say goodbye to loved ones at their Funeral Mass…those are all front-pew days. Happy moments and sad moments – at some point we all have to be front pew people. And, likewise, there are times when we will be middle-pew people…part of the crowd, surrounded by others. 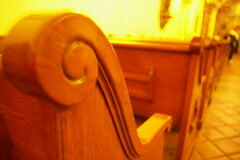 But for me, at this time of my life, the back pew is still the best seat in the house.